Anti-bacterial. Naturally derived. Kills 99.9% of bacteria. Certified cruelty free. You think you're so smart don't you? Well... you are, okay? You win. Anti-bac, but not as you know it. You're gonna love this... 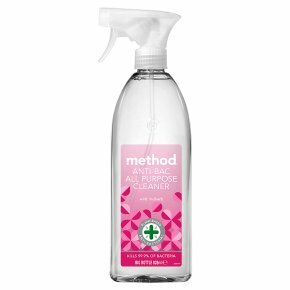 There's a new anti-bac in town and it's made with a new naturally derived lactic acid formula that smells like wild rhubarb, not chemicals. Plus, you'll be happy to know that it kills 99.9% of bacteria*, the only thing left is a sparkling sense of satisfaction. *Including enterococcus hirae, staphylococcus aureus, escherichia coli, pseudomonas aeruginosa. Easy to use: Spray on surface. To disinfect, leave to work its magic for 5 minutes. Wipe with a damp cloth. Counter tops, high chairs, bins, door knobs Psst: Test in an inconspicuous place first. Surfaces vary. Not suitable for use on natural stones or porous surfaces, such as marble or limestone. WARNING. CAUSES SERIOUS EYE IRRITATION.<br>Keep out of reach of children. IF IN EYES: Rinse cautiously with water for several minutes. Remove contact lenses, if present and easy to do so. Continue rinsing. If eye irritation persists: Get medical advice/attention. If medical advice is needed, have product container or label at hand.